NETWORK FINALS: THURSDAY NIGHT FOOTBALL adjusted to 4.3, down half a point from last week’s game. CABLE HIGHLIGHTS: NFL Network’s share of THURSDAY NIGHT FOOTBALL was down 0.07 from last week to 1.04. MTV’s JERSEY SHORE dropped 0.14 to 0.61. The MLB PLAYOFFS are in gear, including a 0.57 rating on MLB Network, and 0.52 on Fox Sports 1. Fox News’s TUCKER CARLSON TONIGHT led cable news at 0.40/0.65/3.9M, with MSNBC’s RACHEL MADDOW SHOW at 0.30/0.44/2.8M, and CNN’s CUOMO PRIME TIME at 0.23/0.33/1.3M. 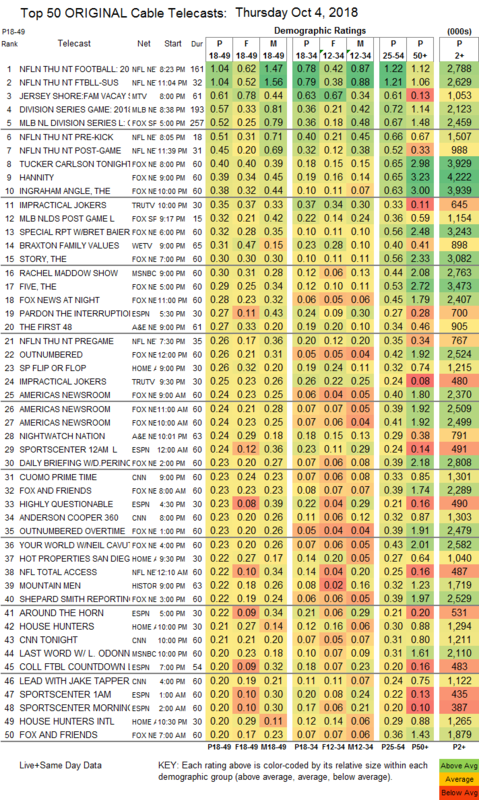 Tru’s IMPRACTICAL JOKERS aired episodes at 0.35/0.25, compared to last week’s 0.29. We’s BRAXTON FAMILY VALUES jumped 0.11 to 0.31, and BOSSIP was up 0.03 to 0.14. A&E’s THE FIRST 48 was at 0.27/0.20, and NIGHTWATCH NATION was at 0.24. On HGTV, FLIP OR FLOP gained 0.02 to 0.26, HOT PROPERTIES was at 0.22, HOUSE HUNTERS lost 0.03 to 0.21, and HOUSE HUNTERS INTL ticked down to 0.20. History’s MOUNTAIN MEN was at 0.22/0.17. ID’s TO CATCH A KILLER returned at 0.19, and THE CORONER was at 0.18. BET’s THE GRAND HUSTLE climbed 0.06 to 0.16. Food Network’s BEAT BOBBY FLAY slipped 0.02 to 0.14, and BITE CLUB held at 0.13. Bravo’s SHAHS OF SUNSET fell 0.16 to 0.11. 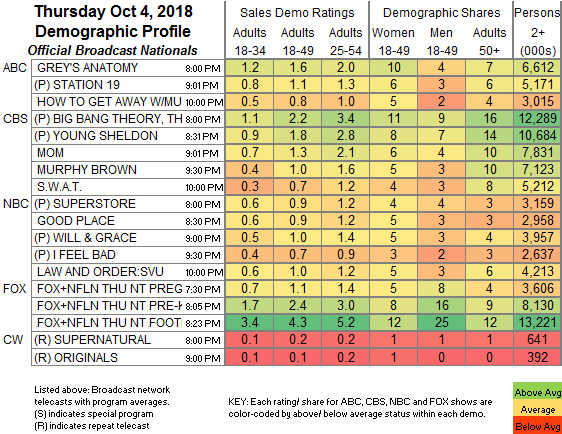 POP’s IMPACT WRESTLING ticked down to 0.05.